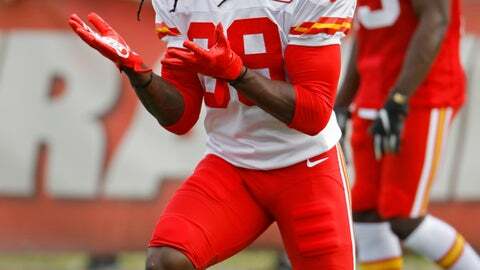 Now, if defensive back Tremon Smith can perform anything like Tyreek Hill when he steps onto the field for the Chiefs’ preseason opener against Houston on Thursday night, general manager Brett Veach and coach Andy Reid will have hit on something special at a position of tremendous need. Then there’s that speed — that world-class, can’t-catch-me speed. Either way, that’s some serious speed. The popular Madden video game even acknowledged Hill’s wheels this year, when it granted him a 98 on its 1-to-100 scale for speed, making him the league’s fastest player. Speaking of Hester, the longtime Bears special teams dynamo, he’s one of several players Chiefs special teams coach Dave Toub has been showing Smith on video. Toub also tutored Hester in Chicago and thinks Smith has the instincts and, yes, top-end speed to have a similar impact. The Chiefs were taking a flier on Smith by selecting him in the sixth round, clearly reasoning his speed alone made him a worthwhile gamble. But he’s also turned some heads on defense, working his way into the mix with the second team at a position that could be crucial to Kansas City’s success. “I think he’s going to be a really interesting guy there,” defensive coordinator Bob Sutton said. That shouldn’t necessarily come as a surprise. Smith picked off 15 passes over four years at Central Arkansas, even though teams rarely threw his direction. He also held his own against Power Five schools, picking off a pass against Oklahoma State in 2015 and leading Central Arkansas in tackles against Kansas State — his team’s only loss before the FCS playoffs last season. As you’d expect, he’s doing it fast. NOTES: LBs Reggie Ragland (knee) and Anthony Hitchens (hamstring) took part in some of Monday’s practice, working together for the first time in camp. … WR Sammy Watkins left practice early with a hip issue, though the extent of it is unclear. OL Dillon Gordon left with a shoulder injury.